"SaaS and Web Content Management"
What is the relationship between SaaS and cloud computing? What are the core principles which makeup the fundamental building blocks of a SaaS application? What are the four layers of security which is used to safeguard customer data in a SaaS environment? What are the business benefits of Web Content Management when combined with the Software as a Service application? Is SaaS Web Content Management right for your business? 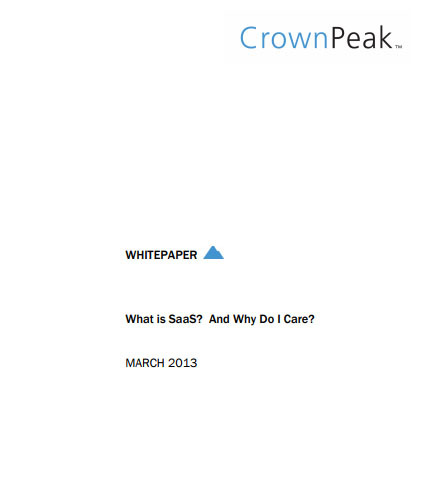 Read this whitepaper on “What is SaaS And Why Do I Care?” that helps digital marketers and technology managers understand the true definition of SaaS, and eliminate preconceived objections about the benefits of a SaaS-based delivery model. What is Software Applications ? Application software can be categorized into three disparate classes: systems software, programming software and applications software. These applications are task oriented and come in various types, which includes database programs, word processing, web browsers and spreadsheets. It is also known as productivity programs, since it enables end-users to complete tasks, such as creating documents, spreadsheets, databases, sending email, designing graphics, and even playing games.